On the Electrocardiogram, Leads are the tracing of the electrical potential difference between two points, either two electrodes (bipolar leads) o a virtual point and an electrode (unipolar leads). It is important to know leads should not be analysed separately but as a whole, as each lead is a different point of view of the same electrical stimulus. Let’s imagine a bus in the centre of an industrial building. This building has 12 windows, outside of which people are able to see the bus inside. If we could take a photo from each window, we would end having 12 different pictures, but all of them from the same bus. Something similar happens with leads on an Electrocardiogram. Each lead is a different “picture” of the electrical activity of the heart. Depending on the electrical plane of the heart they register, we will group leads into limb leads (frontal plane) or precordial leads (horizontal plane). It is the name given to the electrocardiogram leads that are obtained from the electrodes placed on the limbs. This leads provide electrocardiographic data from the frontal plane (not from the potentials which are directed forward or backward). Limb leads are grouped into bipolar leads —also known as classic or Einthoven leads— and augmented unipolar leads. Limb Leads and Einthoven's Triangle. They are the classic electrocardiogram leads as described by Einthoven. They register the potential difference between two electrodes situated in different limbs. Lead II: Potential difference between right arm and left leg. Vector oriented to 60º. Lead III: Potential difference between left arm and left leg. Vector oriented to 120º. Triangle and Einthoven’s Law: The three bipolar leads form what is called the Einthoven’s Triangle (named so after the inventor of the Electrocardiogram). These leads maintain a mathematical proportion explained by the Einthoven’s Law, which says: II = I + III. This law is of great value when Interpreting an Electrocardiogram. It allows us to determine whether the limb electrodes are correctly placed; if the position of any electrode is altered, this law would not hold, thus allowing us to realise the EKG is not correctly done (See How to perform an EKG). On the Electrocardiogram, the unipolar limb leads register the potential difference between a theoretical null point at the centre of the Einthoven’s triangle and the electrode of each extremity, thus allowing us to know the absolute potential in that electrode. These leads were initially named VR, VL and VF. The V stands for Vector and R, L and F stand for Right, Left and Foot. Afterwards a lowercase a was added, which stands for augmented (present time unipolar leads are augmented with regard to the initial ones). aVR: Right arm absolute potential, vector oriented at -150º. aVL: Left arm absolute potential, vector oriented at -30º. aVF: Left leg absolute potential, vector oriented at 90º. There are six precordial leads. They are designated by a capital V and a number from 1 to 6. They are unipolar leads, they register the absolute potential of the point where the electrode of the same name is placed. They are the leads best suited for pinning down Left Ventricle abnormalities, especially of the anterior and posterior walls. On a normal electrocardiogram, QRS are predominantly negative in V1 and V2 leads and predominantly positive in V4 to V6 (Rs pattern). 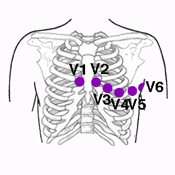 V1: This chest lead registers potentials from the atria, part of the septum and the right ventricle anterior wall. The QRS complex is formed by a small R wave (septum depolarization) followed by a deep S wave (ventricles activation), see QRS Morphology. V2: The electrode for this precordial lead rests over the right ventricle wall. Therefore, the R wave is slightly bigger than in V1, followed by a deep S wave. 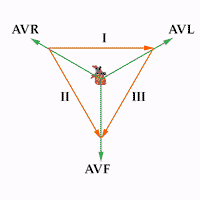 V3: It is the transitional lead between the electrocardiogram left and right potentials, as the electrode rests over the interventricular septum. The R and S waves are almost identical (Biphasic QRS). V4: The electrode for this chest lead rests over the left ventricle apex, where the walls are thicker. Therefore, it presents a tall R wave followed by a small S wave (right ventricle depolarization). V5 y V6: These electrocardiogram leads are situated over the Left Ventricle myocardium, which has thinner walls than in V4. Therefore, the R wave is not as tall as in V4, preceded by a small q wave (septum depolarization). Related Article: Right-Side and Posterior Leads. When suspecting of a Right Ventricle Infarction or Posterior Infarction, it is advisable to place electrodes in unusual positions. When Posterior Infarction is suspected, three electrodes have to be placed in the back to realize the Posterior Leads. When information of Right Ventricle Infarction exists, or the patient has Dextrocardia or Situs Inversus, the electrodes will have to be placed in the right side (Right-Side Leads). More information: Right-Side and Posterior Leads.